Check out some of my favorite 501 inspiration photos and read below for tips on finding that perfect pair! 1. 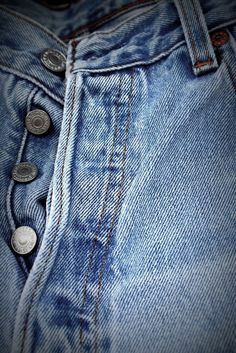 Vintage Levi's are 100% cotton - they tend to shrink over the years from all of the washing and drying. Your best bet is to go up 2"-3" from your normal waist size and start there. For example, if you wear a modern size 27, you might wear a tag size 30 in vintage Levi's. 2. Fit is everything - find a pair you especially love from the thigh up. The waist should fit nicely and your bum should look oh-so great. These two areas are most important to the overall look and are not the easiest or cheapest parts to change. 3. Your tailor is still your best friend! When you find that perfect pair, take them to the tailor to narrow the the thigh and leg area and/or shorten the hem. Trust me, this is the real magic behind the jeans. And as you break them in, they beautifully mold to your body and really do look and feel like second skin! Find your perfect pair of vintage levi's here!